Where are you going on your next holiday? If you have already been to Vietnam and loved its urban districts and metropolitan areas, it is time to go back and succumb to the charms of its beaches. 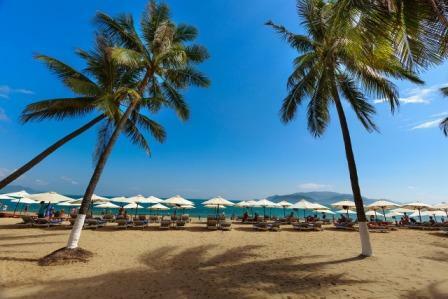 Although they gradually have turned into tourist resorts, perhaps more popular than you would wish, the Nha Trang beaches located on the southern coast of Vietnam are still a paradise worth finding. In this post, we will give you some tips on how to arrive and how to make the most of your trip. In case you are wondering, any time of the year is appropriate to visit Nha Trang, since temperatures stay mild from January to December. The area is perfect for a peaceful retreat, with hotels and resorts close to beach, usually affording spectacular ocean views; however, if you are looking to have fun, it also has water parks, nightlife and a variety of sports and adventure tours you can join. Besides, the capital of the Khanh Hoa province boasts a rich local gastronomy, popular for seafood and grilled dishes, and takes pride in being a main stopover for some important yatch races in Asia as well as a luxury cruise port. To get further info about these and many other things you can do while in Nha Trang, Vietnam, head over to the visitor information centre by Cho Dam Market. Whether you are flying from overseas or you are taking a tour around Asia, you will be able to travel to Nha Trang by train, by bus or by airplane. Should you choose the railway as your first option, know that there are overnight trains from Ho Chi Minh City to Nha Trang, as well as services from Hanoi, Da Nang and Thap Cham, even though it should be borne in mind that they make a lot of stops and the journey might take an entire day (24 hours). When opting for a bus commute, the most recommended departure points is Da Lat (taking between three and four hours). Travelling from Ho Chi Minh City to Nha Trang by bus takes nine hours on average. If you will be arriving via one of the international airports in Vietnam, you may book a domestic flight to Nha Trang from either Tan Son Nhat or Noi Bai and be there in less than two hours. VietJet Air, JetStar, China Southern and Vietnam airlines operate direct flights to Nha Trang several times a day. In spite of the fact that it is known for its sandy beaches of crystal-clear water, you should not forget that Nha Trang is a capital city in Vietnam with plenty more to offer, so make sure you make some time to explore and visit some of its main attractions, namely the Alexandre Yersin Museum, the Pasteur Institute, the Mountain Church, the Gautama Buddha Statue inside the Long Son Pagoda and the Palace of Emperor Bảo Đại. And last but not least, an unforgettable trip should include a ride on the Vinpearl Cable Car. That being said, if you tend to feel more attracted by activities that imply being in touch with nature, go to the Nha Trang Oceanography Institute, the Trí Nguyên Aquarium and visit the Yangbay Waterfall. And if you simply cannot stay away from the sea, go outdoors and take a boat tour to go island hopping to some of the most beautiful off-the-coast places in Vietnam: Monkey Island, Ebony Island and Bamboo Island -to mention but a few.